Bizarre giant salamander found in Florida, and it looks like an alien. You’ll find plenty of interesting creatures if you march through a Florida swamp. There’s alligators and crocodiles of course, as well as various species of snakes and other creepy-crawlies, but one animal in particular has eluded scientists for a while. It’s a species of giant salamander that can grow up to two feet in length, and researchers only just now documented its existence. The salamander, which goes by the scientific name Siren reticulata (meaning “reticulated siren”) is a species of giant salamander that sports a unique leopard-like pattern of spots along its body. 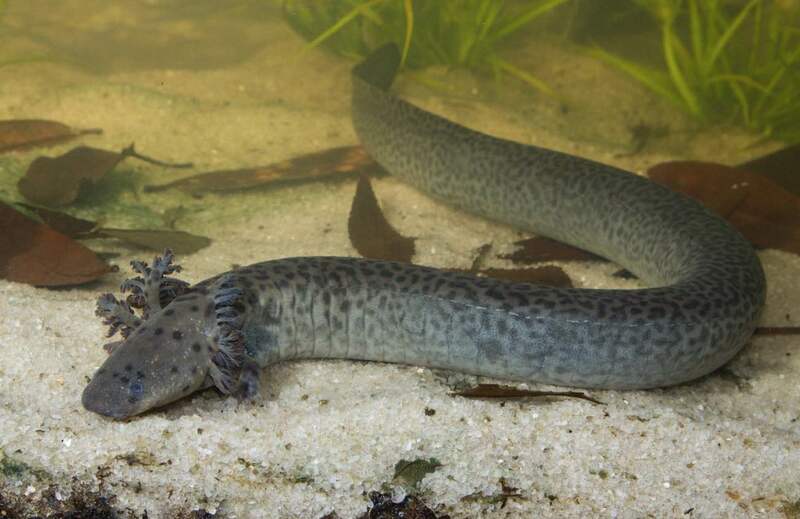 With no hind legs at all, its body is more like an eel than anything else, and its massive external gills give its head a frilly appearance. The large salamander had gained a somewhat mythical status in scientific circles prior to its official discovery and description. Salamanders like this new species had been spotted and spoken about at length but actually documenting new species takes a significant amount of time. This new paper finally puts all those whispers to rest and serves as a reminder that some yet-to-be described species are still waiting to be found, hiding in plain sight. In this particular case, it took the researchers half a decade to find enough of the salamanders to accurately describe the species and confirm it as a new species.